The intro for one type of Bonus Mission! Bonus Mission! is a minigame that appears in Yoshi Topsy-Turvy. The player has a chance to play this minigame after completing the last area of a mission and landing on Yoshi's head from a Bonus Chance! 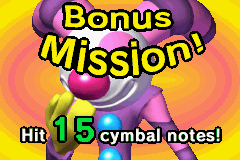 The objective of this minigame includes hitting cymbal notes a certain amount of times with a Wrecking Ball, detonating a certain amount of bombs within a specific time limit, or catching a certain amount of coins. The player can have a higher chance of playing this minigame depending on what kind of medals they obtain. If the player fails, he or she may try again until they win. The "Mission Cleared!!!" screen for the coin catching Bonus Mission! The "Mission Failed!" screen for the coin catching Bonus Mission! This page was last edited on February 12, 2018, at 23:31.